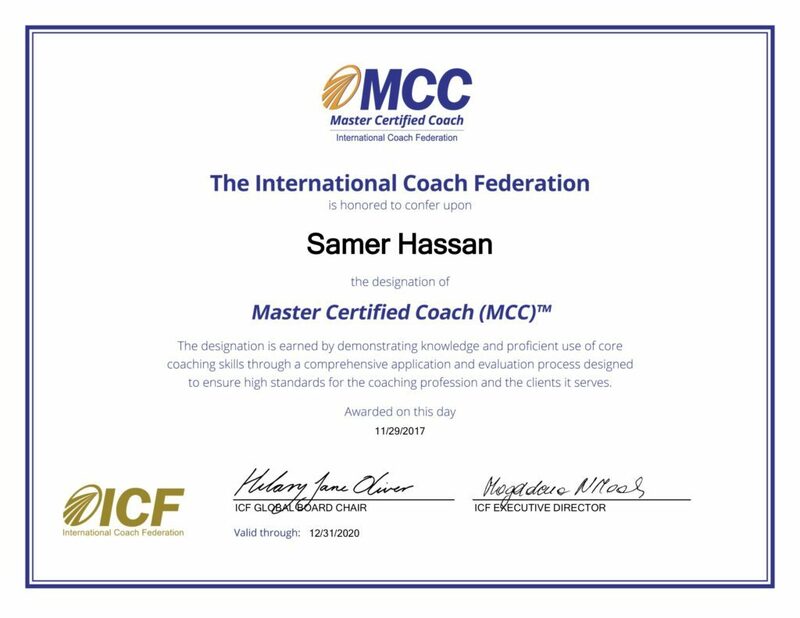 Samer is the first native Arabic speaker worldwide who obtained the MCC (Master Certified Coach), the highest credential level in the world with more than 4000+ coaching hours. One of the only 20 MCC coaches who operate simultaneously in the Middle East, Africa, and Europe. He is a New Ventures West USA Professional Certified Coach in the Integral development methodology. A Professional Certified Coach by the Integral Coaching Canada training company. Certified in many powerful coaching tools as Clean Language, by David Grove and 360. He has jointly developed the Spheres of Interaction and profound listening coaching tool with Suzanne Nault, a Canadian psychologist. Samer has developed a robust and highly successful Coaching Skills for Managers programs, and Coach Training and Mentoring programs, widely used in Italy and the Middle East. Samer has worked with organisations and individuals in different roles ranging from an executive coach, mentor coach, and corporate trainer. Working with private, government and not-for-profit organisations, with schools and multinational companies, to develop their leadership, increase culture and inter-culture cohesiveness and maximise the capacity and productivity of their people. Samer’s clients include Senior Managers, Directors, VP’s and CEO’s. He has coached in renowned organisations such as the UK Diplomatic Academy in the foreign and commonwealth office, Bank of Intesa Sanpaolo, AlexBank, Emaar King Abdullah Economic City, Motorola Solution Saudi Arabia, Public Health Agency of Canada, UNDP (Canada) and (Egypt), National Research Council, Federal Government of Canada, Diplomats at the Italian Ministry of Foreign Affairs in addition to coaching prominent Middle Eastern figures. Samer currently resides in Italy, serving his clients in stages, conference centres and training rooms around the world through his enterprise KUN. Samer Hassan is joined at Kun by a strong network of associate coaches to bring you the very best training and growth. Each associate coach is certified by the International Coaching Federation (ICF) or an equivalent reputable coaching governing body such as the European Mentoring and Coaching Council (EMCC) or the International Association of Coaching (IAC).Not only do our coaches have the necessary training and certification to bring about transformation in leaders and organisations, they bring with them decades of professional experience and leadership in international organizations to better understand the real concerns of leaders, teams, and individuals in today’s global marketplace. Are you ready to work with our team of coaches to transform your global organisation?